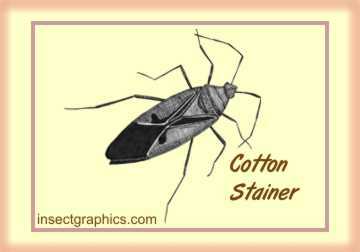 Cotton stainers are �true bugs,� usually a reddish color with black, brown and white markings, and about � to 1� long. There are several species; this drawing is a St. Andrew�s Cotton Stainer, found in the southeastern United States and the Caribbean. Small pale eggs are laid singly or in small loose groups, on the plant or dropped to the ground. They look like tiny hens� eggs, and hatch in about a week. The young insects feed in groups during the 5 wingless, immature stages, which last about a month. The adults develop wings, and a white marking in the shape of a St. Andrew�s cross on the backs of their wings. Cotton Stainers feed on cotton, as well as fruits and ornamentals, especially plants in the mallow family. They get the name �cotton stainer� because in their feeding they puncture the seeds in the cotton bolls. The juice which exudes from the puncture stains the cotton lint an indelible yellow. Additionally, microorganisms and fungus may grow at the feeding site. The cotton fibers may be damaged or cut as well, affecting the maturation of the boll.